Everything happens for a reason and I really do think that my supposed birthday trip which was postponed was meant for me to realize what is more important – my family. It was a cold, breezy, rainy day before Aug 7 when I was stranded and left without no choice but to spend the night at my boyfriend’s house until the weather calms down and the rain settles; the road was a parking lot, blocked by cars, flood starting to build and zero visibility. Come morning after, the rain started to settle. Early crack of dawn, I drove my way home and rested but the day was welcomed with much rain. The garage was flooded albeit it has already drained and dry; worrying was part of the reflex. Instead of taking a nap, I rose up and decided to head out to Check on my mom and grandma who lives in Cavite. Thanking the accessibility of technology and the network was still working strongly well; I was told by mom that my grandmother was already lying on her inflatable bed and the flood is almost waist deep. Almost left stranded. So near yet so far, I sought for help by asking if there are boats that I can rent nearby or perhaps if there’s any alternative route I can take to get me to my Mom and Grandmother; the pedicab drivers said its impossible as the flood along that area is impassable. Drove my car to as far as it could and parked it for my safety; I had to stay calm and think of ways to get to them. I can’t get stranded, something should be done. I figured, asking wont hurt and seeking for help. The people seemed to be used to managing themselves; one of those men whom I sought for few questions about who their leaders are told me not to expect any attention from the mayor. The network died out just when I needed it; a nearby parlor gave me access to her Internet. The road to feeling helpless is unacceptable. I figured, twitter. If there’s a will? There’s a way. Ask. 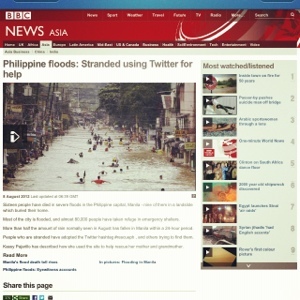 Adding the hashtag #rescueph, sent in the information and sought for help. Meanwhile as I surveyed around the areA from those men and women I was stranded together with; I was told who the district congresswoman is. Ah, the daughter happened to be a schoolmate back in my alma matter and she’s on twitter! Grateful that she was online, the immediate response was coursed through and her mother, The congresswoman took action on the rescue without fail. You may hear the story how twitter saved my loved ones through BBC World News and CBC Radio during The Wednesday Editon, As It Happens with Peter Armstrong.